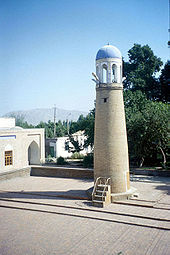 The territory that now constitutes Tajikistan was previously home to several ancient cultures, including the city of Sarazm of the Neolithic and the Bronze Age, and was later home to kingdoms ruled by people of different faiths and cultures, including the Oxus civilisation, Andronovo culture, Buddhism, Nestorian Christianity, Zoroastrianism, Manichaeism and Islam. 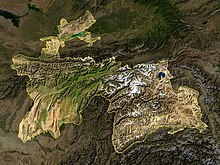 The area has been ruled by numerous empires and dynasties, including the Achaemenid Empire, Sasanian Empire, Hephthalite Empire, Samanid Empire, Mongol Empire, Timurid dynasty,the Khanate of Bukhara, the Russian Empire, and subsequently the Soviet Union. 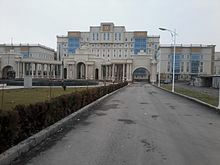 Within the Soviet Union, the country's modern borders were drawn when it was part of Uzbekistan as an autonomous republic before becoming a full-fledged Soviet republic in 1929. Drug trafficking is the major illegal source of income in Tajikistan as it is an important transit country for Afghan narcotics bound for Russian and, to a lesser extent, Western European markets; some opium poppy is also raised locally for the domestic market. However, with the increasing assistance from international organisations, such as UNODC, and co-operation with the US, Russian, EU and Afghan authorities a level of progress on the fight against illegal drug-trafficking is being achieved. Tajikistan holds third place in the world for heroin and raw opium confiscations (1216.3 kg of heroin and 267.8 kg of raw opium in the first half of 2006). Drug money corrupts the country's government; according to some experts the well-known personalities that fought on both sides of the civil war and have held the positions in the government after the armistice was signed are now involved in the drug trade. UNODC is working with Tajikistan to strengthen border crossings, provide training, and set up joint interdiction teams. 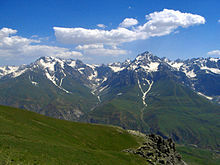 It also helped to establish Tajikistani Drug Control Agency. 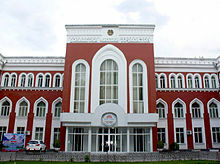 Tajikistan is also an active member of the Economic Cooperation Organization (ECO). 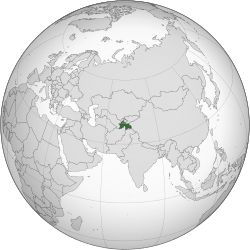 Besides Russia, China is one of the major economic and trade partners of Dushanbe. Tajikistan belongs to the group of countries with a high debt trap risk associated with Chinese investment within the Belt and Road Initiative (BRI) meaning that excessive reliance on Chinese loans may weaken country's ability to manage its external debt in a sustainable way. ^ Vakulchuk, Roman and Indra Overland (2019) “China’s Belt and Road Initiative through the Lens of Central Asia”, in Fanny M. Cheung and Ying-yi Hong (eds) Regional Connection under the Belt and Road Initiative. The Prospects for Economic and Financial Cooperation. London: Routledge, pp. 115–133. This page was last edited on 25 April 2019, at 15:13 (UTC).